My thoughts when casually strolling through Just Fabs website after seeing these shoes were “I NEED THESE NOW” and “ADD TO CART IMMEDIATELY”. I had never had a just fab membership prior to this purchase and because of being a first time subscriber I got a major discount on this unique pair of heels. 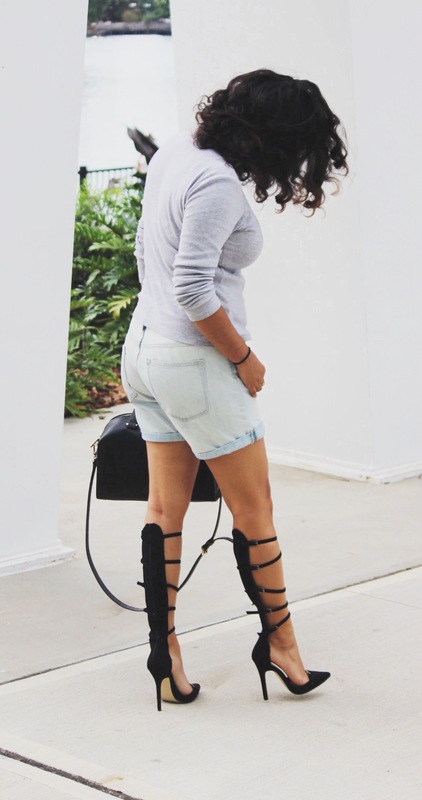 They are a cross between a pump, sandal and gladiator style and add major interest to any outfit. I will admit I had a hard time at first pairing these with anything in my wardrobe because they are such a standout focal point and they were competing with my other elaborate choices. I finally settled on the basics, denim boyfriend shorts from the Gap, grey turtle neck and round eye sunnies to ward off the rays. They are a bit high and the arch is killer so I wouldn’t recommend these for a night out or to be walking or standing for too long, but the strap going all the way up the calf provides a great supporting feeling. Also I had trouble adjusting the straps to be as tight as possible (hence why some of them are slipping) I wish it would have come with more pre-punched holes. I absolutely love these and they will remain in my closet as my “art for my feet” knockout stars that I can pull out when I want to stand out. Links to items below!